Scooper - Technology News: Where do people pay the most tax? Where do people pay the most tax? Belgians pay higher tax rates than any other citizens in OECD countries, according to the organization’s new Taxing Wages 2016 report . 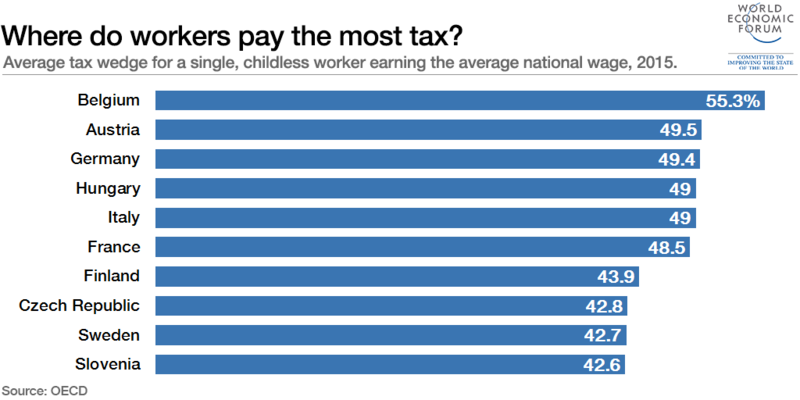 A childless, single worker earning the average national wage in Belgium has an average tax wedge of over 55%. The tax wedge refers to personal income tax, employer and employee social security contributions, minus family benefits received as a proportion of total employer labour costs. Across the OECD, the tax wedge on the average worker was 35.9% in 2015 – the same as the year before. Following Belgium, Austria has the second highest tax rate. The average childless, single Austrian has a tax wedge of just under 50%. The top three is completed by Austria’s neighbour Germany. Here, the wedge is marginally lower at 49.4%. At the other end of the scale, average earners in Chile pay just 7% tax. Across different household types, a varied picture emerges. For example, for a single-earner family with two children, the tax wedge is highest in France, at 40.5%. The overall picture is one of higher tax burdens in Europe, compared with other OECD nations. The majority of European countries sit above the OECD average of 35.9%. This interactive tool from the OECD allows you to explore the situation across household types and tax levels.